Studies have repeatedly shown that immediate bystander CPR combined with defibrillation within 3-5 minutes of a collapse can help improve cardiac arrest survival rates. There have been several instances in Charlestown where quick CPR and AED use have helped save a life. If you don't know CPR, we encourage you to learn. Charlestown EMS maintains a database of AEDs throughout the town. To have the most updated system possible, we need to know the location of every AED in Charlestown. 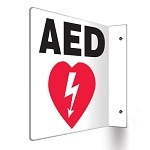 If your business or organization has an AED, please report its location through our new online form below. For questions, please contact Chief Andrew Kettle. Charlestown EMS can also help an organization choose the best defibrillator and train staff. Charlestown EMS teaches courses on CPR and how to use an AED. Remember, you are never alone in an emergency. Call 911 for help.